Farmers’ markets can become licensed by the United States Department of Agriculture to accept federal food benefits (SNAP; known as FoodShare in WI). In order to accept FoodShare, farmers’ markets need to have terminals that can process electronics benefits transfer (EBT) information, which allows for the process of government benefits to the authorized retailer. Refer to the resources below for more information on getting started with and expanding your farmers’ market EBT program. MarketLink is a new way for farmers’ markets and direct-marketing farmers to get authorized as FoodShare/SNAP vendors and get the equipment they need to accept SNAP benefits. Some farmers’ markets may be eligible to receive free equipment. SNAP/EBT At Your Farmers’ Market: Seven Steps to Success. From Project for Public Spaces and Wholesome Wave Foundation. 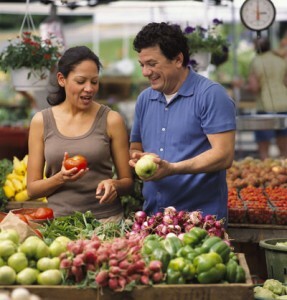 USDA Food and Nutrition Service (FNS) fully supports implementation of incentive programs at farmers markets. Farmers markets interested in offering incentive purchasing programs to users of FoodShare, WIC or Senior Farmers Market Nutrition Program must let USDA FNS know of their plans during initial authorization or subsequent reauthorization. Learn more at the USDA FNS website. The WIC Farmers’ Market Nutrition Program (FMNP) is associated with the Special Supplemental Nutrition Program for Women, Infants and Children, popularly known as WIC. Farmers’ markets can also become authorized to accept the WIC FMNP. To learn more about how to accept WIC FMNP vouchers at your market, visit the Wisconsin Department of Health Services website. The Senior Farmers Market Nutrition Program (FMNP) provides vouchers to seniors to use at farmers’ markets. To learn more about accepting Senior FMNP vouchers visit the Wisconsin Department of Health Services website. Wisconsin Department of Health Services (through 09/2014). Learn more by contacting Rachel Witthoft. The following instruments were developed by a workgroup of county Extension educators and public health professionals to support evaluation of EBT at farmers’ market programs in Wisconsin. Suggested protocol for implementing the questionnaires is included in each of the documents. Questionnaire language can be adapted to account for local EBT program names. Please help us develop a statewide story for use of EBT programs at farmers’ markets. We would appreciate you informing Amber Canto and Kelli Stader of your intent to use this tool so that we can be sure to take your efforts into consideration. Note: This survey will be administered by email to all market managers via the Wisconsin Farmers’ Market Association.